Screen printing for summer festivals and events – The short sleeve season is here and it will bring screen printing for summer festivals and events to a new level in the form of promotional t-shirts all across the country. Selling T-shirts at festivals can be a fun way to make part-time income or a full-time living. At Spotlight Apparel you’ll be involved in the entire T-shirt making process, from design through production, and get to hang out at various cultural or music festivals while making money. The festival season is upon us and screen printing companies throughout the country are preparing for the short sleeve season and an influx of orders for festival merchandising and printed t-shirts. Promotional t-shirts as merchandising can be a great way for festival organisers to keep the party going well after the tents are taken down with their satisfied attendees wearing their printed t-shirts out of the gates with an “I was there” sort of pride. You’re walking into a really cool house party in your super awesome [insert festival name] printed t-shirt and you hear that really cool song by [insert cool hipster band name] that reminds of you said festival and then you see someone else with the wristband from the same super cool awesome festival. No words will be needed, just a look paying tribute to your shared experience at the super awesome mega cool festival. And then they will probably say, “that is an awesome t-shirt, wish I had got one”. Screen printing for summer festivals and events is a popular choice for promotional t-shirts and festival merchandise because it is cost effective in large quantities and bulk orders. The best screen printing designs are simple yet effective and can include a number of colors, although it should be noted that the price will increase as the number of colors in your design do. Having said that, you don’t want to compromise on the quality of your t-shirt design because nobody will buy it and as a result there will be no knowing looks or shared experience conversations across the house party. The process of creating an awesome product is often a complicated and detailed journey. Our goal here at Spotlight Apparel is to make that process as easy and quick as possible. Have a look at our process below to get an idea of how we produce the quality screen prints that your company or organization desires. We begin with product selection where you choose the product type, style and quality suited to your specific event. 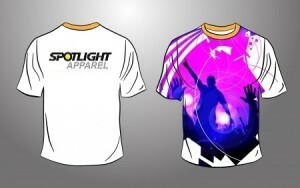 We can print from your artwork or you can submit your concept to the Spotlight Apparel design department. Our trained professional designer can take your idea and develop it into a dynamic composition that is sure to impress. We will first send you a preview of how your art will look. Once the art is submitted to you, you may approve the design for print, or you may give us a few revisions to enhance and refine the design to your liking. Once the design is approved, the art is taken to the screen department and that is where your shirt is inked. The standard turn-around time for screen printing for summer festivals and events is around 5-7 business days. Our goal is to turn your order around as quickly as possible while still maintaining a high standard of quality. Be sure to contact Spotlight Apparel, Inc. of Jacksonville Florida for all your screen printing for summer festivals and events. Posted in Event Planning, Holiday Events, Screen Printing and tagged Summer festivals, t-shirt screen printing, t-shirts for event, t-shirts for festival.